Most loan requests must follow defined procedures for making the application, often including filling in quite a few pre-selected, generic forms. When it comes time to lodge the application, however, you'll need to include a brief cover letter with your application and this is your chance to stand-out. Both the content and format of this type of cover letter should reflect the formal nature of a loan request, but be strong enough to stick in anyone's mind when it comes time to approve your loan. Your cover letter may be your one and only chance to personalise a loan request, so making it stand out is important. In addition to clearly stating what you are enclosing in an application for a loan also use your cover letter to explain why you believe you should be granted the loan. Explain how the loan will be used and highlight the particular strengths of your plan. If there are any weakness to your plan, explain how these will be overcome. Be sure to mention any previous conversations or understandings you may have had with the letter recipient about your loan request. If you are looking for a loan from a venture capitalist or other private investor then you might also want to include details of how and when you plan to pay back the loan. No matter what content you choose to include, always make sure that your letter utilises appropriate vocabulary, proper grammar and correct spelling. Avoid slang terms and contractions. Always reference your company by it's full name. Don't give anyone any reason to reject your loan request based on your cover letter. 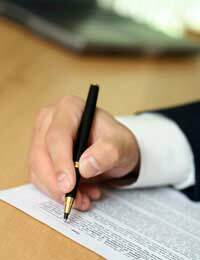 Like any other formal business letter your cover letter for a loan request must include both your name and mailing address and the name and mailing address of the person to whom you are sending it. Don't allow your letter to be sent to a generic mailing address or be addressed only to a position title, research the appropriate recipient until you have a name to include. Make sure you reference the date on which you are writing, and use a formal salutation ("Dear,") and closing ("Yours sincerely,"). Left align your letter and use a professional font such as Times New Roman. Print your letter on clean paper, without any embellishments like borders or images. Do not email your cover letter and application unless you have express permission to do so. Instead, deliver by hand or post. Please find enclosed all of the required documentation for a Small Business Loan from [Bank Name] as detailed by you in our appointment on 12th January. In addition to the standard [Bank Name] application forms I have also included the Executive Summary of [Business Name]'s 2010 - 2012 business plan. In this summary you will find details of [Business Name]'s past activities, current assets, projected growth and expected financial objectives. As you will see, [Business Name] has had fantastic trading results in the past and this loan would be used to help [Business Name] expand and create even better trading figures in the future. If you have any questions or require any additional information about this loan request please do not hesitate to contact me. I will be in touch soon to set up a further appointment to discuss this application. I look forward to working with [Bank Name] in the future.